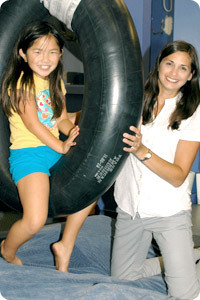 Center for Therapeutic Intervention provides a wide variety of services to our pediatric clients and their families. We perform both standardized and non-standardized evaluation and screening for children to determine areas of strength and vulnerability in motor and sensory areas. Consultation is provided to parents and other professionals in order to enhance each child’s well-being at home and in their educational setting. Our direct services may include both individual and group based Occupational Therapy treatment, as well as parent education. We collaborate when appropriate with physicians and other professionals in the areas of speech therapy, counseling, mental health, and education. Treatment sessions may be scheduled weekly, twice monthly, or whenever is optimal to meet the family’s objectives. Goals for Occupational Therapy are individualized for each client, but the aim for all is to focus on strengths and improve abilities for the ‘occupations’ of school, play, and family life.